Living sustainably means organizing our lives in a way that will allow future generations to be happy and healthy. Permaculture is a method and a way of thinking that addresses designing things with sustainable ideas in mind. It provides a reliable method for organizing that design, and is evolving and expanding every day. Jan Spencer is a prominent figure in the permaculture community in America’s Pacific Northwest. 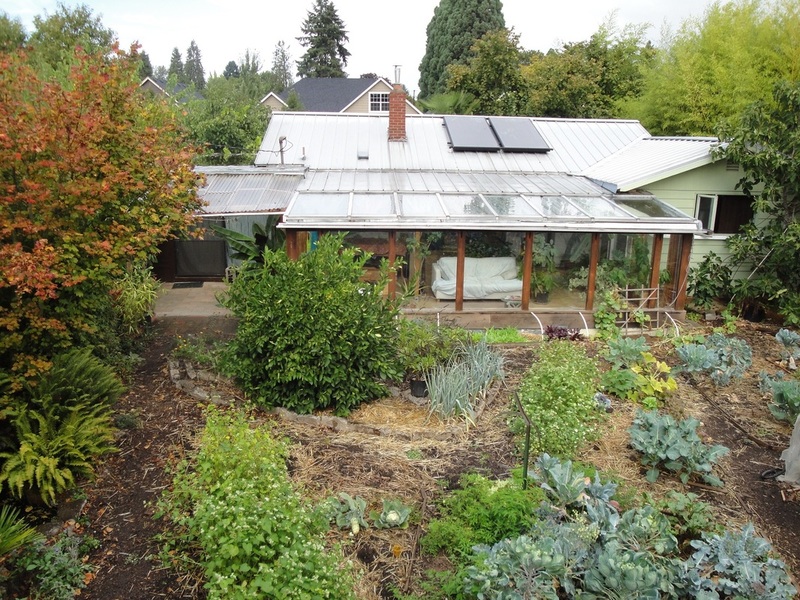 He has both participated in and organized numerous permaculture convergences, and has spent the better part of the past 17 years retrofitting his property in Eugene, Oregon with sustainability in mind. Jan Spencer lives in a house without a driveway. Where there once was a strip of concrete large enough to host six cars, there is now a small sidewalk that passes under a lush, hanging grape arbor. 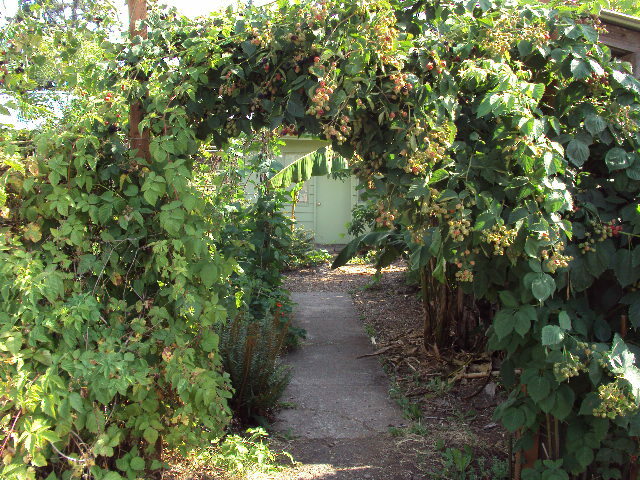 Following the path under the arbor leads you past rows of pole beans, boysenberry bushes, and myriad other thriving plants that supply him with a selection of natural food that would rival a small farmers’ market. The remains of the concrete driveway are stacked next to a modest natural pool in front of the house, where it serves as a gentle waterfall. Tropical plants like palm and banana trees dot the yard here and there, a testament to the sheer ecological diversity present within the confines of this relatively tiny lot. Instead of a hedge dividing Jan’s property from the neighbor’s, they’ve mutually agreed to grow edible plants, like blackberries, over the fence instead. 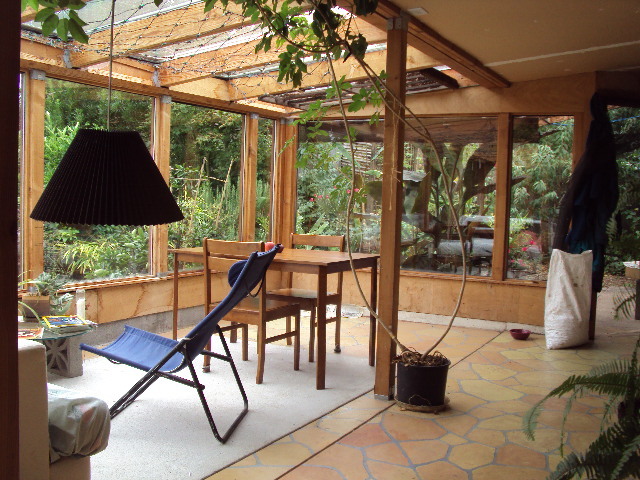 Behind the house, a beautiful sunroom lays claim to more tropical plants and acts as a reading room that heats itself naturally year-round. The backyard that was once covered by lawn now yields cabbage, tomatoes, squash, and blueberries. Trees line one side: lemons, apples, peaches, and even olives. 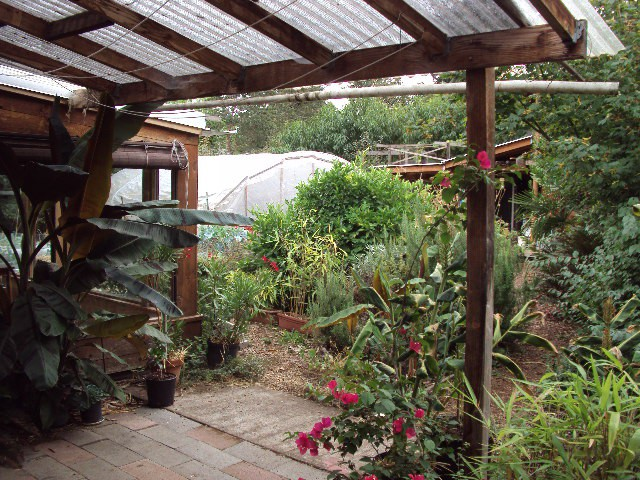 A greenhouse allows Jan to extend the growing season of his produce even further; a large bungalow that he built from the ground up serves as a workspace and living quarters, allowing him to rent out his main house to tenants. Next to the bungalow, a 3,000-gallon water tank collects rain from the roof for distribution throughout the property. It’s not your typical suburban homestead, but Jan isn’t your typical suburban resident. While the places Jan and I call home are only a couple hours apart by car, I didn’t meet him anywhere local. I was three weeks into a month-long trip to Costa Rica. When we met, he was just another traveler passing through the hostel where I was staying. When you’re stuck together on bunk beds in a small dormitory, though, you become acquainted fairly quickly. We ended up spending the better part of a week exploring the area around our little surf town, riding bikes out to beaches and through the jungle — beautiful and wild nature gripped by an unfortunate blight of plastic pollution. By the time I got on the bus to head back across the country, I felt as though I knew Jan fairly well. Immediately, I could tell that Jan is not the kind of person to sit idly by when he’s dissatisfied with his surroundings. Indeed, he’s a natural-born seeker of change, no matter how small — something that repeatedly illustrated his fierce insistence that we abide by no-smoking rules, and that we compost our food despite being surrounded by a local culture that hadn’t yet even made the step to recycling plastic. If something were wrong, Jan would give his best effort to fix it without fail. After he told me more about his passion and life’s work in sustainability, his actions made absolute sense. He sees a stark and glaring issue with the way we live in modern society. Instead of accepting that and becoming cynical, shouting and raging at those that live contrary to his vision, Jan decided to dedicate a sizeable portion of his life to exemplifying the positive traits and efforts he would like to see in others. Whether it’s his eco-friendly home improvement, community organization or permaculture presentations, he’s made it his mission to provide information and encouragement to those that may not understand the problems we’re facing or what to do about them, all while emphasizing action and closeness as communities and neighborhoods. At FP International, we place a premium on sustainable action and ideas, and especially those individuals making it a priority to bring those things a reality. Before I left the little hostel on the Nicoya Peninsula, I was able to sit down with Jan and have a substantial Q&A where he talked about his philosophies regarding sustainability, his fervent belief in something called “Civic Culture,” and his life’s journey that led him to become a permaculture fixture in our Northwestern U.S.
To clear up any confusion, here are some key terms used in the interview. Ally: an individual or organization whose goals converge with the sustainability movement. Even non-permaculture entities can be allies if their ideals align. Convergence: a (usually) local gathering of permaculture veterans and newcomers alike with the overall goal of sharing knowledge and fostering a sense of community. Green Capital: non-monetary assets that add to the sustainability and value of property or lifestyle. Guild: in permaculture, a group that involves strong mutual support and close fellowship. Permaculture: a way of designing things focused on sustainability and a method for organizing that design. Stephen Mann (SM): How did you become involved with permaculture? Are there any significant experiences you’ve had that have defined your career? Jan Spencer (JS): I came upon permaculture when I lived in Houston about 1990 because one of my housemates was into permaculture. There was a permaculture group there […], but I took a “Permaculture Design Course,” which, commonly, is where you stay at retreat center 24 hours a day for ten days. It wasn’t until three or four years later when I moved to Eugene, Oregon, that I encountered a group called a permaculture guild and became involved with that group. There was a community near Eugene called Lost Valley that hosted permaculture events, called convergences. I attended, becoming more familiar with permaculture and the people in the area. One year, they couldn’t host the convergence, so several of us in Eugene said, ‘Well, okay, if we can’t do this at Lost Valley, let’s have it in town!’ We had the facilities for a small event about a block away from my house. We ended up organizing a permaculture convergence, and that was the first time I was sort of a moving force for the event than just a helper or participant. We had a few more convergences in Eugene afterward, and I was involved with all of that. In fact, I became one of six or eight people who [emerged] as the permaculture movers and shakers in Eugene in the late ‘90s and early 2000s. Another very important permaculture landmark in my life was in 2000 when I bought my quarter-acre suburban property. My intention from the beginning was to do a big makeover and turn that into a permaculture suburban property. I’d been a part of a group in Eugene protesting the construction of a big factory, and it was through that group that I became aware of the realm of urban planning. I was thinking about infrastructure: roads, residential, commercial, sewage, water, and electricity. This gave me a pretty critical view of suburbia, and that converged with my interest in permaculture. [American suburbia is] automobile-dependent, it’s resource-intensive, it’s not very social — and that gave me an additional reason to do something about a suburban property. So, I bought this house and immediately began to make changes to it. I put cardboard on the grass to kill it, started taking out the driveway. That would be probably the second permaculture milestone for me, transforming my own property, which I’ve been doing for seventeen years now. I would say the third would be recognizing a spiritual, social, humanistic angle on permaculture and transforming suburbia. It was talking to other people, going to these events, basically expanding myself with what other people were thinking and doing. I realized that this needs to go way beyond a single property. It needs to get into the neighborhood, it needs to get into the community, it needs to permeate into the economy and our culture. Essentially, social sustainability needs to be mainstream. So, that’s when I became involved in the Northwest — not just Eugene, but in the Northwest. If I were to identify a single item that would [help define the beginning of] my permaculture career, it would have to be being the coordinator of the convergence that was in my neighborhood. I was the architect of that. It was the most ambitious organizing I’ve ever done. It was right where people lived, and I even got to show my own property. But again, that exists within a larger context of getting all this out to a wider audience. SM: Your efforts focus heavily on reforming suburbs to better fit in with the demands of our environment. What can suburban residents do right now to help out — especially if they haven’t heard of permaculture? JS: I think that self-education has to be a huge part of it. For people to realize that it’s in their best interest to get a deeper understanding of what’s happening in the world today, and then think about themselves in that context. How do they fit into the climate change, the global stress of various kinds? There is a finite amount of resources, and our affluence degrades our security. It’s important to ponder how we exist within the context of the planet, or the human race. No one is immune to this stuff. The more it’s ignored, the worse it’s going to be. Our wealth can be a huge tool, but we need to direct it in a different way than what it is right now. A lot of the solution has to do with downsizing, which I’ve done a lot of in my life. That’s mostly because I’ve chosen to, and I don’t regret those decisions at all. Anyone can do this, not just people like me, and especially if they’ve got some money. I’m in the poverty zone, but there are plenty of people making more money who could take out the grass, retrofit solar, who could put in edible landscaping. And maybe they don’t have the time or interest to do that themselves, but they can pay someone else. That’s part of the green economy because it would create tons of jobs. An important point, though, is that there won’t be as much material wealth [in needless possessions for] a green way of life, but it will be replaced by human relationships and personal experiences that enrich our lives in a more social sense than having three or four cars. That’s the tradeoff. We need to relearn something called “Civic Culture.” We need to be a part of something larger, as active participants. It doesn’t mean a commune, it doesn’t mean no private property. It means participating and making where we live a happier, more secure place to live, and those are the conditions that bring out positive human potential. The more we manifest our positive characteristics, the more we create conditions that make people want that stuff even more. It’s a very desirable feedback loop. The examples for this new paradigm have to go beyond rainwater systems, passive solar design, and edible landscaping. Those are the physical attributes, but there’s a whole set of social attributes. We’ve already got some of that stuff, like neighborhood associations and communities of faith. Those organizations already have the fundamentals in place for civic culture and social sustainability, and they’re huge allies for us in sustainability. Environmental nonprofits, permaculture organizations, social services; every town has more resources to work with than it realizes. SM: You’ve often stated that positive human potential is “humanity’s greatest renewable resource.” Could you elaborate on that? JS: I think everybody has enormous possibilities in positive ways, in terms of what they can offer the larger human family. That doesn’t mean that everybody is going to be Mahatma Gandhi or Mother Teresa, but they don’t need to do that. I think the purpose of a society should be to help people manifest whatever is in them that’s positive and brings an elevated vibe — it might be playing the saxophone, who knows? We need economics that serve our culture, that are driven by values and put our potential first. Right now we put this value on having stuff, having money — it’s conspicuous consumption to the detriment of everything else. It doesn’t bring out the best in people. There are examples, though, of the economic system responding to what people buy. When I was in college, nobody knew about brown rice, organics, vegetarianism, and now it’s mainstream stuff. There are definitely businesses, products, and professions that fit into a happier world. Some negative values can be adapted, and some will be left behind. The primary goal of a society should be to bring out the best in people. When people are happy, and they feel uplifted, they don’t need as much stuff. We all need a roof over our head; we need food, we need medical care and education. It’s something that isn’t talked about as much as it should be. Humans deserve better than what we have. You deserve better; I deserve better. We all deserve better. SM: You mention “resilience” as an important concept in permaculture. Is that the same as sustainability? If not, what is your definition of a resilient home, or neighborhood, or culture? JS: Resilience is a term that is within the umbrella of sustainability. It tends to suggest the capacity of a system, whether it’s an economy or another process, to sustain disruptions. For example, resilience is being able to respond and repair the damage that could be caused by a big earthquake. My property is in the direction of resilience, although I wouldn’t say that it is any kind of insurance policy against anything that may happen. My capacity to adjust, having thousands of gallons of rainwater on site and having all this food growing, is definitely enhanced. However, resilience, in this sense, doesn’t get down to a single backyard. That’s helpful, but the more people that do this with their own properties and their own lives, the more resilient we all are. This is also a big chunk of the social aspect we’ve talked about, with meeting our neighbors, collaborating and working for a mutual goal–and that is to be resilient when things get disrupted. I consider there to be three general categories of resilience. The first type or resilience is a system having the ability to experience a disruption and return to the same situation it started in. For example, a flood wipes out a suburban neighborhood, and we rebuild the same neighborhood just as it was before with all the things that went into it. That’s not what I’m interested in. Another type of resilience would be the capacity to adapt to different conditions after a disruption. That’s a little bit better, because the conditions afterward may be different, especially when we’re talking about disruption from human causes. Whether it’s an economic meltdown or just the result of a flood, this type of resilience means the ability to adjust afterward. The third type of resilience is much more what I advocate, and that is for people to be proactive, and make resilient choices in their own lives before they even have to. Not only that but to make choices that support a positive direction for the economy before large problems emerge. This is a more purposeful ideal, and it has a set of ideals and conditions that help to inform people what the current resilient behavior would be; lowering our oil dependency, emphasis on local food, less reliance on transportation [are all part of this]. This kind of resilience not only helps diminish disruption when it does happen, but it can also help shape the future — and that’s really important. SM: How can we, as citizens and consumers, convince business owners that the sustainability of their businesses is tied directly to the sustainability of our planet? JS: If people just quit buying [unsustainable] products that don’t fit in, that’s the most peaceful way I can see a transition. […] The market can respond, and if people just quit buying that stuff, you can even see some of that evolution [like] when the [demand for oil goes down] and there are fewer big recreational vehicles made. With that said, there are opportunities here for businesses to majorly cash in on this new green emerging interest. There are lots of examples of new products that fit in, like heat pumps that use a fraction of the electricity used by a conventional heating/air conditioning unit. So there are appropriate technologies and enormous business opportunit[ies] to provide [sustainable] services. I can’t think of a way of making this transition other than a paradigm shift. When this happens, the economy will not be as [superficially] wealthy, because it won’t be fixated on turning [non-renewable] resources into money–whether it’s clear cutting trees or deepwater oil, a green economy won’t include that kind of stuff. Right now, externalized environmental costs are a huge part of business profit, and the greater the external cost a business puts out, the less likely they are to make the transition. Nobody denies that [these costs exist], but they’re not being talked about as much as they need to be. While a green economy won’t involve as much excess, it doesn’t mean living like our grandparents. A responsible economy, its products, and the lifestyles that it serves, would be far healthier than what we have now. It comes down to voting with our dollars for a way of life that is happy and, again, encourages us to manifest our positive potential. For more details on Jan’s suburban transformation project and information on his philosophy, his journey, and updates on his activities in and around Eugene, check out his website, http://www.suburbanpermaculture.org/.